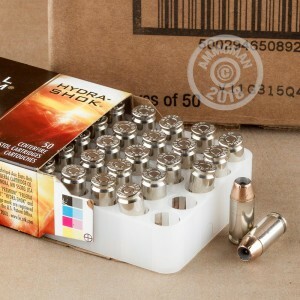 Federal Hydra-Shok Tactical ammunition was designed for law enforcement, but can also help homeowners and CCW holders protect themselves and their families effectively. 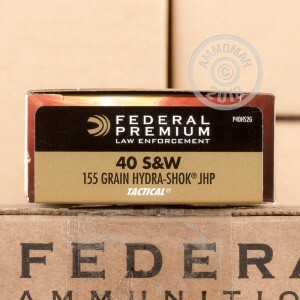 This .40 S&W version is a fast-moving, hard-hitting cartridge that uses a light 155 grain jacketed hollow point bullet to achieve an above average muzzle velocity of 1,140 feet per second. The higher velocity combined with the mass and caliber of the .40 round combine to produce a good chance of incapacitating a target quickly. 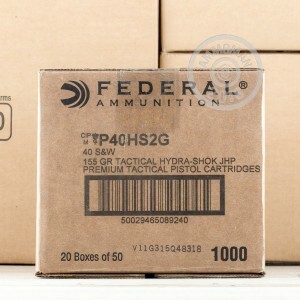 This ammunition comes in a case of 1,000 (20 boxes of 50 rounds each) for the serious tactical shooter. It is manufactured in Anoka, Minnesota using non-corrosive Boxer primers and nickel-plated brass cases.